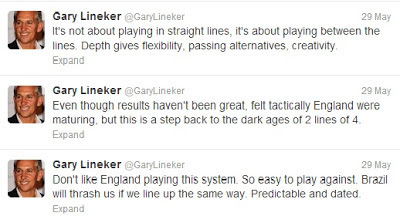 Gary Lineker: Finding his voice? It might not have been the tweet "heard around the world" but the impact wasn’t bad for a brief bout of sermonising in the aftermath of a nondescript football match. Thousands of retweets and replies, questions immediately put to the England manager, hundreds of news articles. 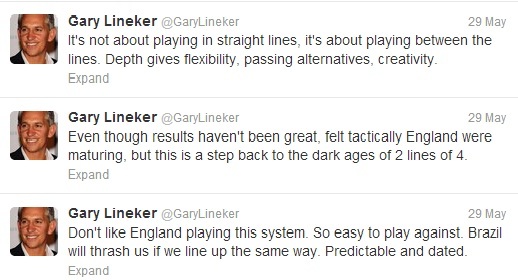 In fact it took Gary Lineker more than a tweet to express his dismay at England’s performance on Wednesday night. Don't like England playing this system. So easy to play against. Brazil will thrash us if we line up the same way. Predictable and dated. Even though results haven't been great, felt tactically England were maturing, but this is a step back to the dark ages of 2 lines of 4. It's not about playing in straight lines, it's about playing between the lines. Depth gives flexibility, passing alternatives, creativity. A former England captain having a dig at the current England team is nothing new and England’s performance against Ireland was distinctly lacking. But the domestic season is done and dusted and column inches still need filled, even after a dullard friendly. So Angry Gary, 52, from Leicester, made headlines. That Roy Hodgson, his blazingly red proboscis perhaps hinting at sunstroke, cited largely unseen comparisons to Borussia Dortmund and then asked for a definition of "dark ages" prolonged the teacup’s localised storm. Silly season. All good fun for the detached observer. The real shock was that this was maybe the most extensive punditry I’ve witnessed from the usually conscientiously mild Lineker all season. Even previous Twitter "spats" have involved broadcasting rivals and Joey Barton rather than a discourse on tactics. Amid the cloying cosiness of the Match of the Day studio, Lineker the ringmaster lets his mates get away with it, even now apparently too mindful of his switch to presenter to challenge Al, Alan or Lawro with any insight of his own. His verdict on England might not have been the most incisive dismantling of an England performance but it tops almost anything Alan Shearer can offer about a Premier League game. Maybe Lineker is one of those "typical twitterers" we used to hear about, sitting in his underpants being brave behind a keyboard only to revert to inoffensive conformity when he leaves the house, hawking anodyne puns and bags of crisps, existing in a state of constant complacency brought on by not being Adrian Chiles. Saying not a lot and always looking a bit too confident of his place in the affections of the nation, little more than a Walkers branded Queen Mum. No longer. Something finally snapped on Wednesday evening. Alan Shearer thinking that simply being Alan Shearer is enough will no longer be tolerated. Alan Hansen thinking that simply being a parody of Alan Hansen is enough won’t wash anymore. Mark Lawrenson thinking that he just about knows where on earth he is just won’t cut it. "It's not about playing in straight lines, it's about playing between the lines. Depth gives flexibility, passing alternatives, creativity." It seems football’s ability to sail serenely through uncertain economic times continued apace in 2012. Estimates suggest that, in the year of the much celebrated London Olympics, football attracted $4.5 billion in global sponsorship. Other sports continue to flounder in the wake of the global game. Football sponsorship as business sense remains high on corporate agendas and big deals are still being signed. Arsenal have reportedly joined forces with Puma in a deal worth over £150 million across five years, snuggling up to their £150 million, five year deal with Emirates. Exactly the sort of figures that might make a trophy hungry boardroom feel a little less famished. Meanwhile Manchester United still lead their English rivals in commercial earnings, sponsorship drawn from a global roster of sponsors that extends to over 30 partner organisations. United are the trailblazers for the wealthy elite, pairing off with other global brands, football carrying the message of airlines and beers, car firms and energy giants to every corner of the earth, providing the perfect ambassadors for multinational globalisation. Others might have eclipsed his talent but it’s likely that David Beckham’s ability to sell underpants across continents will survive the end of his playing career. In football’s brave new world success can still mean trophies but it can also be measured by global brand profile and a marketing strategy to crack emerging markets. In the 150th year of the English Football Association maybe none of this should surprise us too much. A more regulated game at home gave those Britons travelling the world, for Empire and for trade, a platform to spread the word of football. Those early football missionaries often travelled in the hope of getting rich or adding to their existing fortunes. For them football was a sideline, but might they recognise something in the motivation of these big clubs, along with UEFA and FIFA, as they find new fans ("consumers") using the power of corporate globalisation and the potential of modern media channels? Greed might bind the generations but our modern day footballing missionaries are at least less destructive than many of those that went before. Maybe this is just another stage of football’s evolution, a concentration of wealth on a global stage, destined to exist above more mundane and impoverished local leagues. There is at least one sobering thought for those of us in Scotland: while football enjoyed $4.5 billion in marketing revenues last year, the SPL was unable to replace a sponsorship deal that would register in the very low millions annually.